Mario has made some progress on the doors. 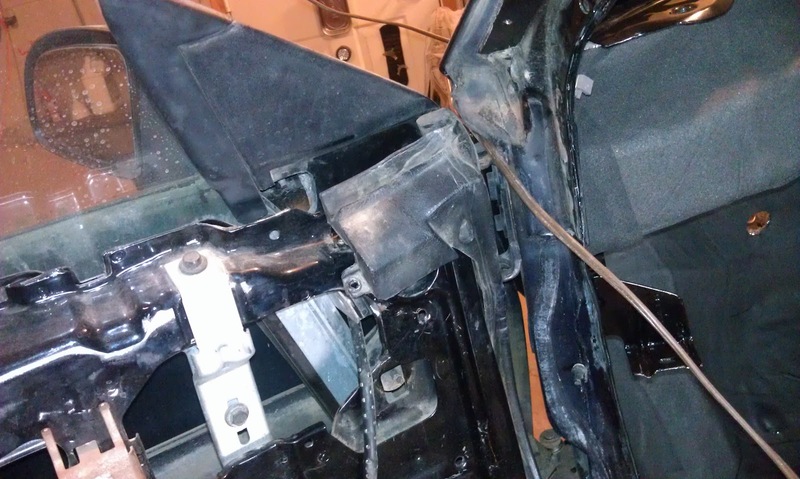 This is the passenger door. Mario said there were no surprises on this door, other than a lot of layers of paint. 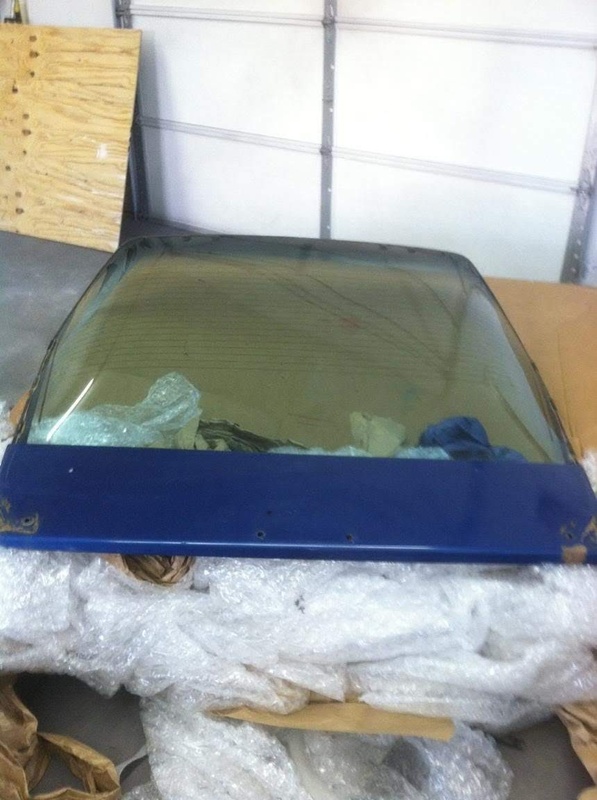 After finding out from Mario that the trunk lid on the donor hatch glass I found was rusted in several spots, I decided that I wanted to use the original one. 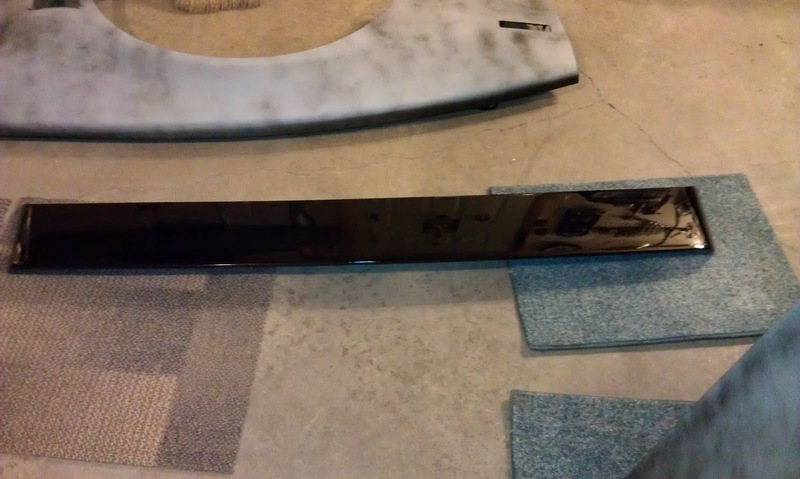 On Friday Sara and I decided to get the trunk lid separated from the hatch glass so that it would be ready to take to Mario. 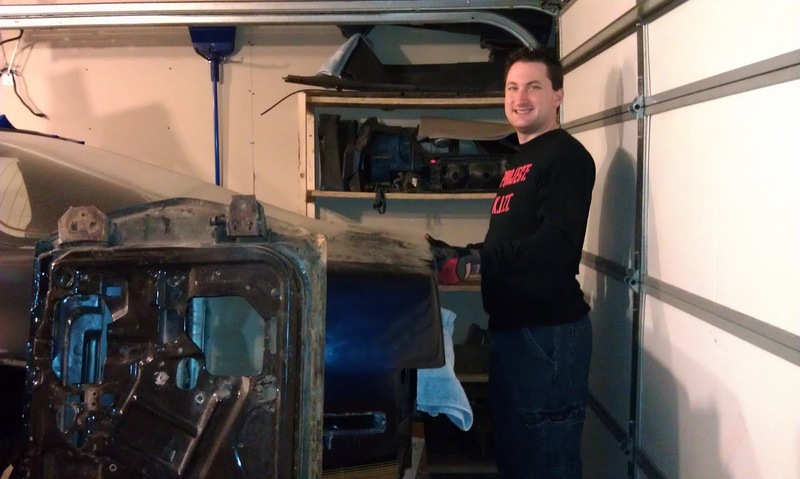 Mario stopped over this afternoon to drop off the fenders and hood and pick up the doors. 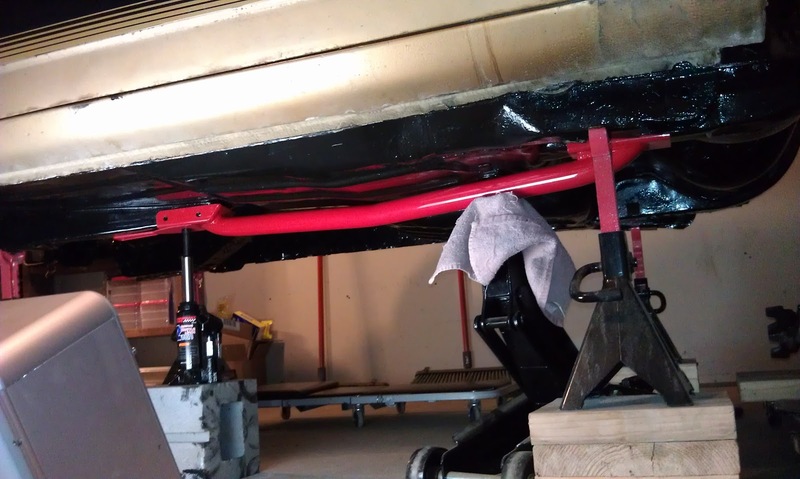 I decided that I also wanted him to paint the front bumper black, so I unstrapped the bumpers from the shelves and pulled out the front bumper. 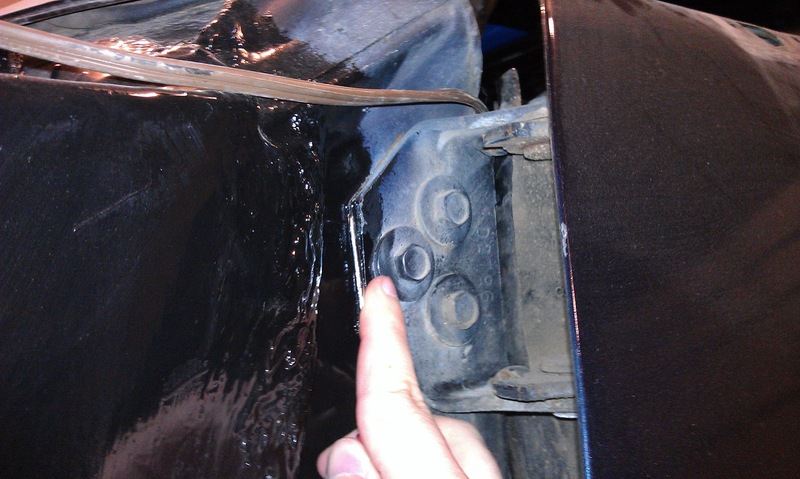 Then I resecured the rear bumper to the shelves so it would not fall over. Mario pulled up and we opened the garage door. 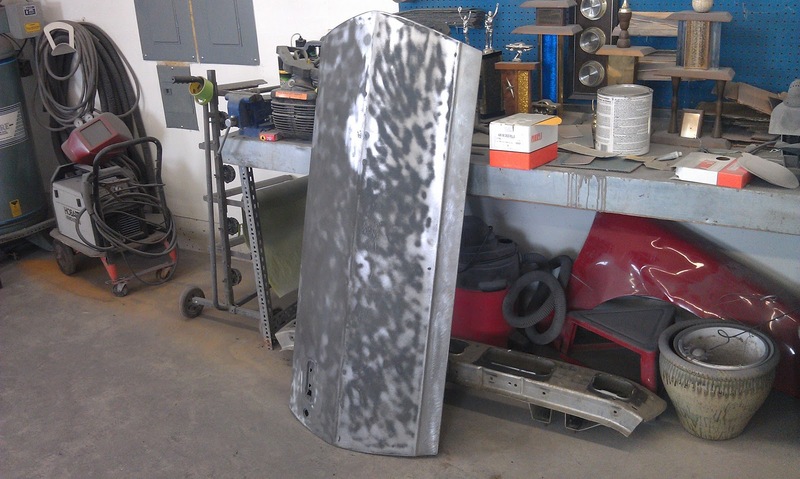 He brought in the driver side fender first and explained that the hood and fenders were in primer and guide coat. 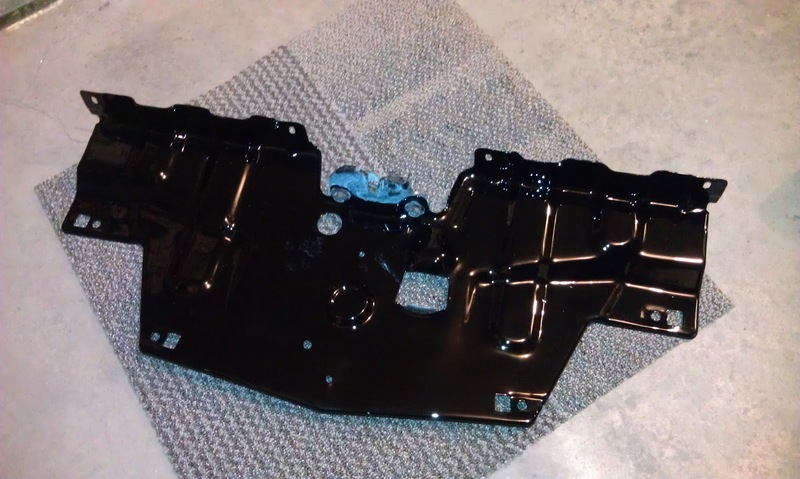 The insides of the fender jambs and the underside of the hood have been painted in gloss black. 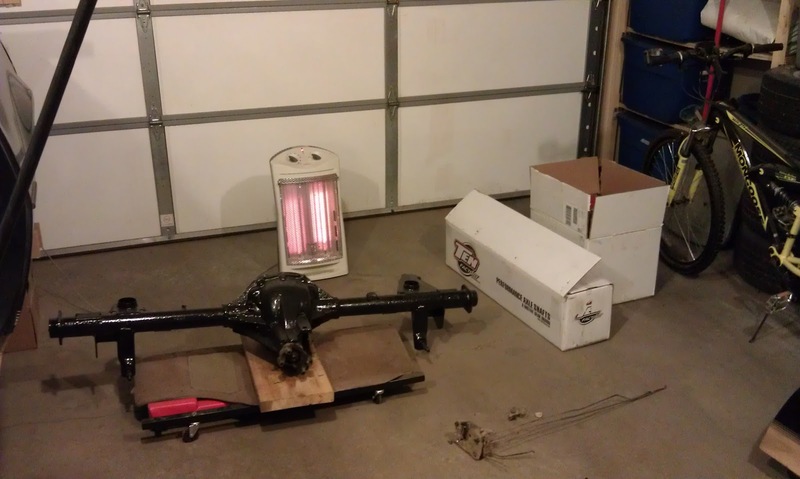 Troy called today and said he is ready to work on assembling the rear end this weekend. He sent Joel over to pick everything up. I plan to help with as much as I can and if nothing else at least get some pictures. 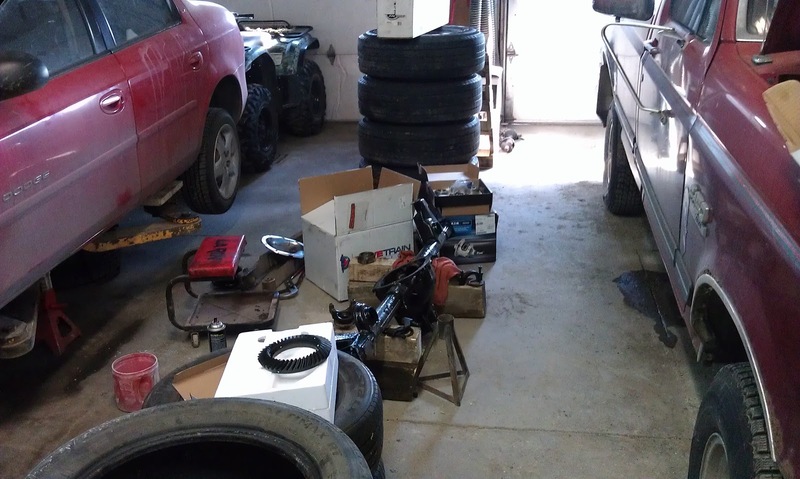 I was also going to get rebuild kits for the front and rear calipers, but Troy found out that he can buy rebuilt calipers cheaper than he can get the kits. He is ordering those for me and will be pressing in the new polyurethane bushings on the front control arms this weekend, too. Today after work I wanted to finish up the doors so Mario can pick them up tomorrow. I needed to remove the armrest brackets from both driver side doors so I could swap them. 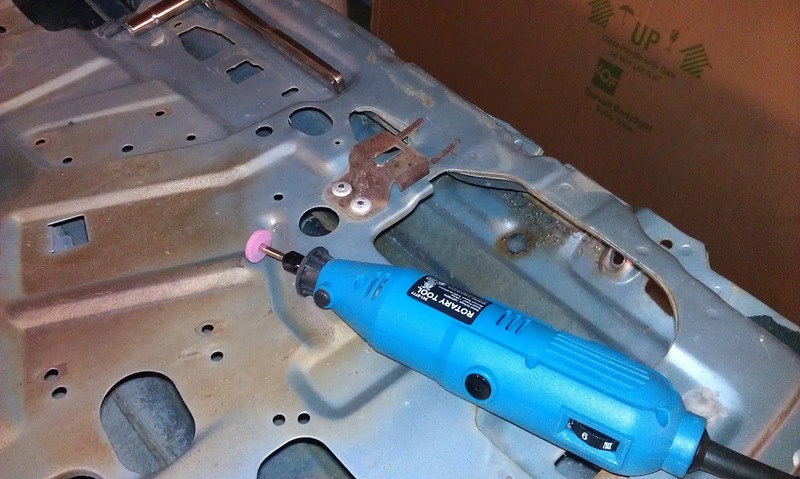 I started by grinding down the center of the rivets. 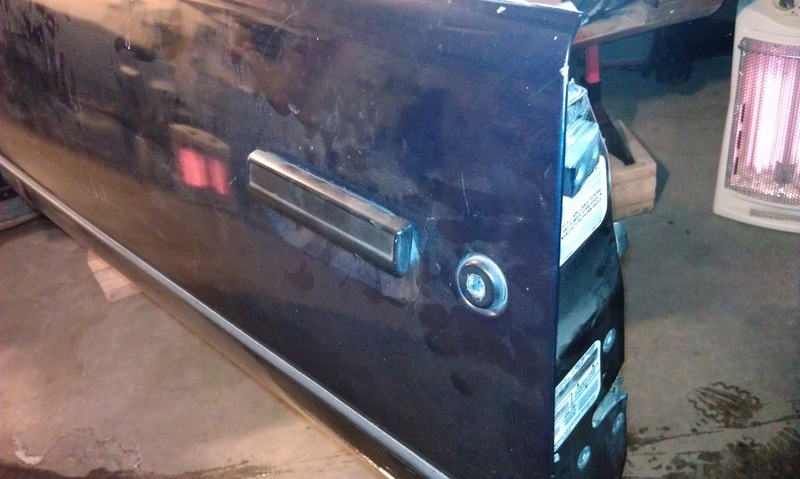 Wednesday after work I started by scribing the outline of the door hinges on the driver side door. I really do not see any adjustments or how they can be mounted incorrectly, but it was mentioned multiple times online that it was important to do so - so I did. Yesterday morning did not start out the greatest. 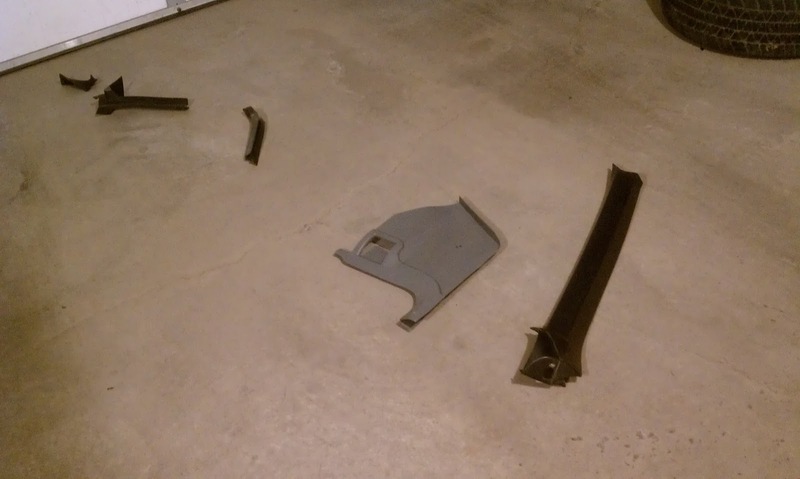 When Sara left for work and put the garage door up, one of KITT's interior plastics fell just enough to catch on the garage door. When she put it back down it ripped a bunch of the plastics free and threw them to the ground. :( Sara took these pictures over her lunch break so I could see the damage. 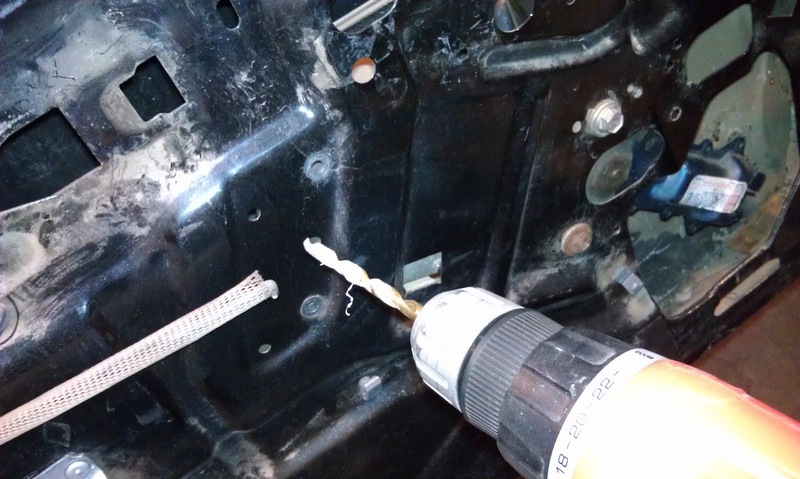 I started by drilling out (read mutilating) the two rivets holding the power lock actuator. These two rivets were the hardest to remove. I am not sure why, as they were the same type used everywhere else on the door. 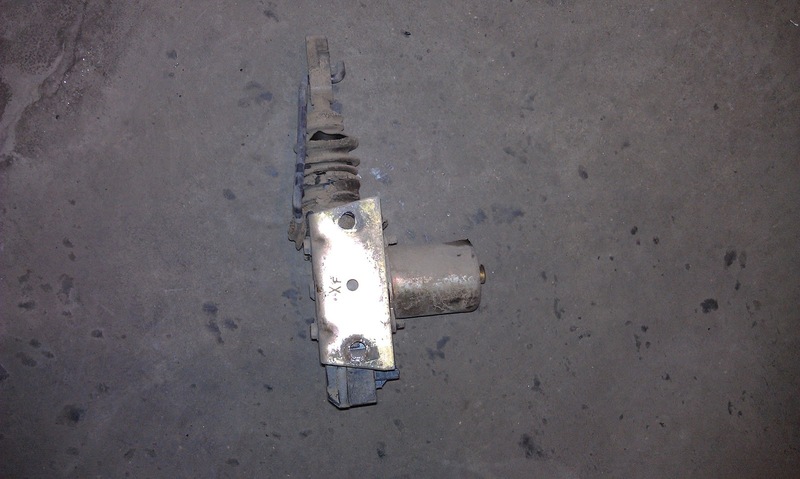 Here is the power lock actuator. Mario called tonight to let me know that he has the underside of the hood and the fender jams painted and they are ready to be brought back over. He would also like to pick up the doors, so he can begin the prep work on them. 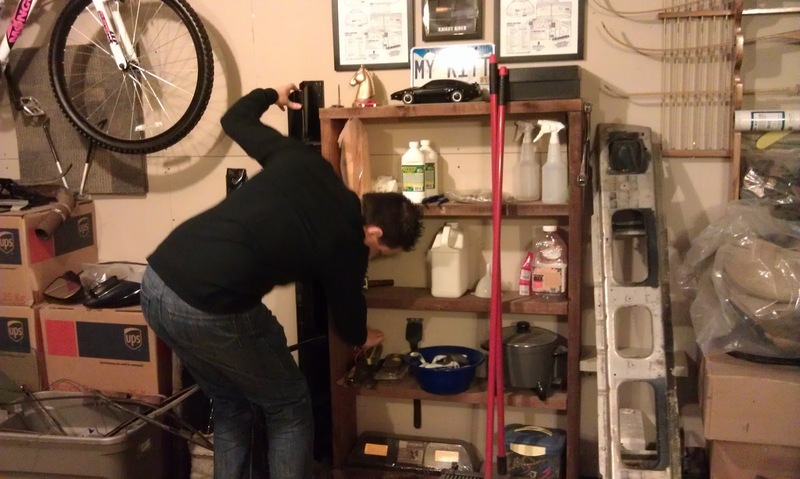 Lately it has been very cold so I have not been working in the garage. Although this is not conducive to working on KITT, it has allowed me to get caught up with a few other things that I have been needing to get done. I told Mario that I would have the doors ready for him by the end of the week, so no matter how cold it is in the garage I need to get those doors finished. I have been searching the local stores for the Hot Wheels Retro Entertainment version of KITT which came out in early December of last year, but have come up empty. None of the stores, in this little town known as Aberdeen, have even been stocking the Retro Entertainment series. Tonight we went to Walmart - thrilling to be sure! I checked the Hot Wheels aisle, as I always do, and lo and behold there was the Retro Entertainment series. They had two of four pegs filled, one of the Scooby Doo Mystery Machine and one of the '32 Ford from American Graffiti. I was excited to see that they were finally stocking the line, but disappointed that was all they had. Then I spotted KITT lying on the shelf down below. Score! I quickly snatched it up only to hear a little boy come running over and say "Oh man! Do you know what you just found? That is KITT! You know from Knight Rider! That is soooo cool!" I said "Yes, yes it is cool!" Now, I just need to find at least one more so I can open one of them.